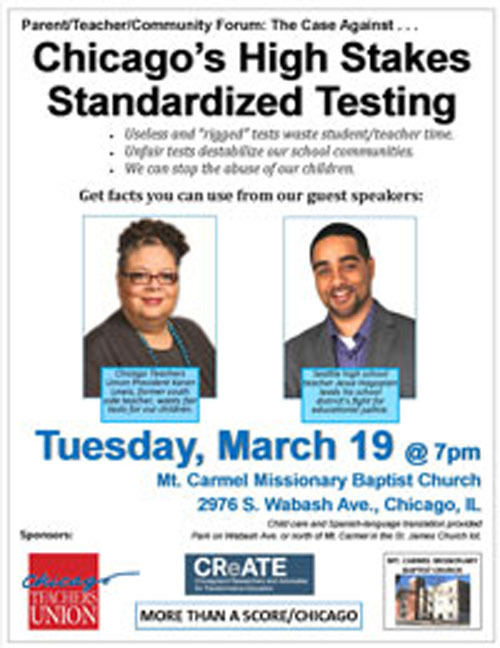 The Chicago Teachers Union continues its "Pencils Down" program of resistance against the misuse of testing and the regime of high-stakes testing with a March 19, 2013 forum on Chicago's south side featuring CTU president Karen Lewis and Jesse Hagopian, a teacher who helped organize the boycott of the MAP test at Garfield High School in Seattle. CTU poster.The forum, which elaborates on the critique of high-stakes testing that has been evolving from the work of teachers and researchers at the CTU, is expected to draw hundreds. It takes place during the weeks prior to the announcement of the 2013 Hit List of schools to be closed. It takes place in that part of Chicago where high-stakes testing has resulted in the closing of the largest number of schools, impacting the Bronzeville community like slow death over more than a decade.